Daniel and I are here in Seattle and geeking out a little about attending PAX in the morning. Me more so than him. It’s been a long day of traveling and getting some major junk together. Getting what together, you may ask. DVD’s and business cards, actually. We’ll be handing these bad boys out to some folks in the gaming biz over the weekend. The DVD’s have the TLW season recap, some of our shorts and the first episode of Web Zeroes, due out next week. And before you ask, no, you can’t have one (sorry, supplies are limited). This will be a good way for us to get our name out there to some of these cool dudes that we’ll be meeting. Now, it’s time for bed and then off to adventures tomorrow. 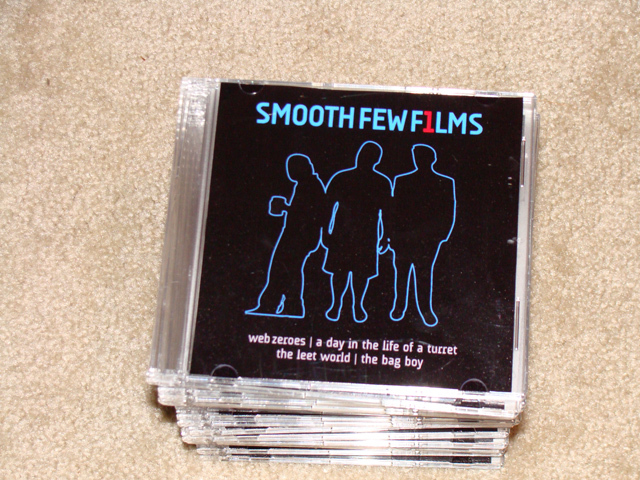 Hopefully we’ll have some cool Smooth Few Films related news to report shortly. In the meantime, keep an eye on GamerSushi for videos and pictures from the PAX floor. Edit: We’re handing these out to business-types, not just random people. Thought I should point that out. This entry was posted in News, Web Zeroes and tagged dvd, gamersushi, pax, smooth few films, TheLeetWorld, web zeroes on August 29, 2008 by Eddy. I;m sad that we can’t get the dvd. But I’m still looking forward to web zeroes. now that just aint fair. how come the guys at PAX get dvds and not us? what happened to “thanks to all the fans”? If web zeroes is live action, does that mean it’ll be able to be on DVD? [quote comment=”11222″]Hold on a second. Now you just need to get these out in large quantities for sale here on the site and you guys will be making some good revenue. Anywho, we’ve said it before and we’ll say it again- we can not sell these, because they have property belonging to other people on them (Halo 3, CSS, etc). And we’re not going to mass produce them to give them out for free because that’s just silly and expensive. We’re giving them out to business folk (not fans) to promote ourselves here at PAX. You said that you can’t sell your DVD because the games belong to someone else. And yet folks like Red vs. Blue are dishing out Boxed Sets, t-shirts, even mugs! So how is it that they can and you can’t? It hardly seems fair unless they’ve cooked up some special deal with Microsoft. I’m not a lawyer or anything (yet) but that smells even to me. The DVD can be a Colector`s Item! Can you post the DVD image and the covers so that we can make our own DVDs? As I heard in podcast (ep4 i guess) you said that it`s legal. Anyway have fun at PAX. *dresses up like a business folk* Why Hello there. Who might you be? That idea(Handouts) is really genius! Red vs. Blue definitely has deals with Bungie and Microsoft, why do you think they made videos about new Halo 3 MAPS and other promotional material? For the ability to sell their DVDs, and become a viable business, they must have signed a contract or whatever, and so Bungie forced them to make promo vids for certain things. So until you see Smooth Few Films make a promo vid about the new CSS map, level, character class, etc., there won’t be any DVDs these guys will be selling or they’ll be sued by Valve/Microsoft/Bungie. well guys i think this calls for a little bit of my favorite quote for success addative dont you think? but i hope u guys won’t get all buisnessy and only allow some videos on the DVD and not for us on the website. 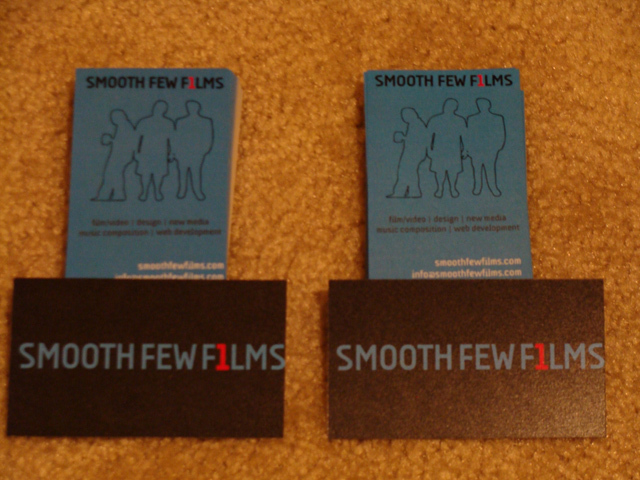 Great business cards! You’ll definitely be famous with those in Japan! To all of the people providing helpful instructions on how we can start selling TLW on DVD… don’t you think we’ve already considered all of the options and spoken with Rooster Teeth about this exact subject? We have. Things just aren’t that simple, guys. Copyright law and the licensing of intellectual property are some of the most complicated legal matters you can imagine. Making things doubly difficult is that machinima exists somewhere in a continuum with fan fiction and mashups… legally questionable, and oftentimes looked down upon as not much more than wankery by the original content creators. This does not work in ones favor when asking a giant multi-national corporation if you can make money off of their intellectual property. Ask yourself… what’s in it for them? [quote comment=”11241″]Red vs. Blue definitely has deals with Bungie and Microsoft, why do you think they made videos about new Halo 3 MAPS and other promotional material? For the ability to sell their DVDs, and become a viable business, they must have signed a contract or whatever, and so Bungie forced them to make promo vids for certain things. I really loved reading the comments about RT selling merchandise. [quote comment=”11253″][quote comment=”11241″]Red vs. Blue definitely has deals with Bungie and Microsoft, why do you think they made videos about new Halo 3 MAPS and other promotional material? For the ability to sell their DVDs, and become a viable business, they must have signed a contract or whatever, and so Bungie forced them to make promo vids for certain things. Thank you, i’m really happy with them. We just have to support SFF until they can be recognized by Valve as a source of new income. And I hope that time comes soon because I WUNT DEEVDEE NOW PLOX. [quote comment=”11300″]We just have to support SFF until they can be recognized by Valve as a source of new income. And I hope that time comes soon because I WUNT DEEVDEE NOW PLOX. when can i get a copy?